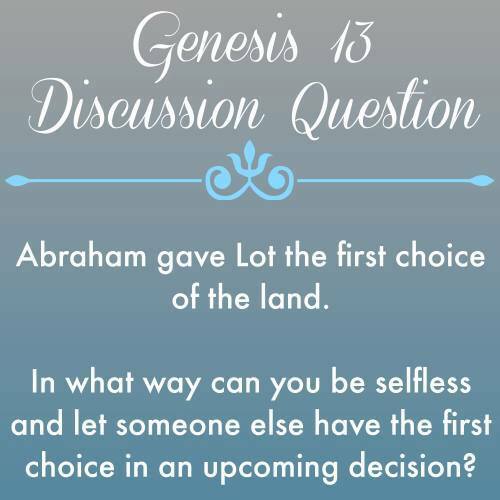 Today we are up to Genesis 13 where Abraham and Lot’s herdsman have a conflict and they separate. 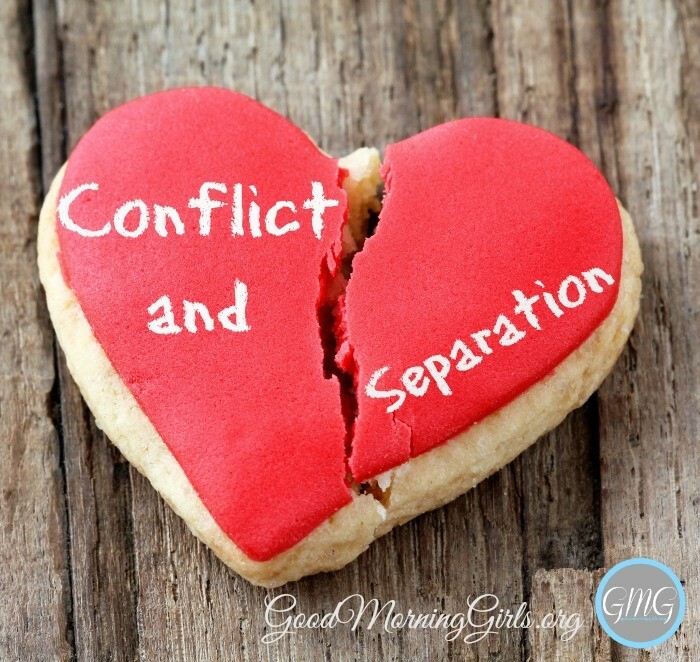 Have you ever been in a conflict and had to separate? I have – that’s why I hope you’ll watch today’s video. What are you learning so far in your reading in Genesis? Have you ever had a conflict where you needed to separate to resolve the issue? How did God work through this? BLOGGERS: Are you blogging through the Bible with us or have you written a devotional based on your own quiet times this week? Link back to GoodMorningGirls.org or put this graphic in your post and then link up below – we’d love to come visit you! I can’t see the video??? I’ve been trying to download 5 different times over the past 30 min? Thanks for such a great video Courtney! I’ve been in a conflict for a while with someone, and despite all the attempts that I’ve made to reconcile, the other side has refused. I have felt guilty for walking away, but I just needed peace so badly…I couldn’t continue the fighting. It’s so nice to hear that walking away can be godly…it’s such a relief to know! This is one of your best yet. I know you have experienced some of this first hand so you have walked this walk and are not just talking the talk. Thank you for a great example because for me this story’s biggest lesson is on how to handle conflict with others. Out world seems to be overrun with people causing conflict these days. Thank you, Courtney. I was led to come to this decision to separate from my parents and sister a few years ago due to the tangled roots of family dysfunction. I pray for healing and restoration on this side of heaven, all in God’s timing and will. I love reading through the Bible with you. Thank you for all your messages. Your work for the Lord is truly blessing to me. Thank you so much for this message. I am in the midst of a family separation right now; your words have encouraged me to continue focusing on Christ and to just hand it over to Him. Courtney, I have been a long time Bible reader, but I can’t tell you how much I am learning through Good Morning Girls. The SOAP method has taken my Bible Study to a new level. I am seeing things that I have never seen before. I can’t wait to get up in the morning and see what is new!! Shar’s journal left my mouth agape…my poor pitiful drawings in my journal are laughable, but I am having a great time and falling deeper in love with my Lord. THANK YOU!! Thanks, Courtney!! I love blogging through the Bible with you! I will admit there are days when I read the story, and I can’t see past the story itself to find the real meaning of what I’m reading. Your blog posts and videos are so helpful in deciphering things that are not so obvious sometimes. My whole world is transforming because of the work that you are doing for God. Your book is such a blessing to me, and I have found so much joy in my marriage, my family, and my home as I go back to it time and again for advice. It’s hard when you’re a woman who loves God, but you grew up in a “Christian” home where it was “do as I say, not as I do.” My parents always sent us to church with our grandparents while they lived worldly lives. I mean, they were “good” people, they just weren’t God people. It was confusing, and I am still trying to recover from parts of my childhood and adolescence! I am 27 now with 2 boys of my own, a 6 and 1 year old, with a husband who is an unbeliever, and it is a struggle! But I am growing closer to God every day, and the joy I feel every day is just unbelievable. Thank you for being a role model to women everywhere and showing us how to grow in the Lord and be a blessing to our families! It is truly wonderful to have someone to help guide me along the path that I’ve always wanted to go down, but didn’t quite know how to get there. You are an inspiration to me, and my heart is glad and thankful for you, Courtney. God bless you! I love your blogs and just the way the Lord has allowed you the view his word the way that you and then how you are able to present it to us in a practical way to get a deeper understanding of his word!!! My prayers are with you and you grow deeper in his word and as your ministry continues to reach more and more women!!! This video and blog post was just what I needed to hear from the Lord. So thank you!!! I’ve experienced conflict with other believers & it was painful to separate. I struggled with taking it personal & feeling hurt & discouraged. This was a good reminder that conflict is apart of life because we are human, flawed & sinful. I think I made the right choices, my hearts intent is to please God. I am learning to walk closer with our Lord and I just want to say how much I appreciate all of the videos. My Meme (Grandmother) and I both enjoy learning God’s Word through it as well. Now I can start applying it to my life more and making better decisions with conflict and sisters. Thank you! I love reading your devotionals, but it’s hard to do it cause I don’t have internet at home and I would really like to be able to write down notes and have a little time to actually pull out my Bible and study along with y’all. Is there any way that you can make these printable? Like, so I could print each lesson out and just 3 hole punch it, put it in a binder, and get my study on? I’m not even supposed to be on here during work hours, but it is the only time I have to get to read the devotions and I really enjoy them. I really enjoy following along with your study, I have read the Bible before but you are giving me whole new insight and understanding!! Thank you so much!! You are a gift! !